Like Super Dave Osborne, I throw myself into various culinary adventures heedless of the outcome, and so far I’ve usually succeeded well enough in the end— my first loaf of crusty bread was crusty in the same way a Sherman tank is, but within a few more tries, it was pretty delicious, and I’ve been making it ever since, happily. Likewise, the first thing I tried out of Michael Ruhlman’s Charcuterie was bacon, and it went so well that, with a few refinements (such as buying better pork), I was soon renowned as a bacon maven. This time, though, I may have been beaten. Maybe I’m just tired after a long day, that’s what my partner in charcuterie Cathy2 suggested, but this one feels like it got away from me, I bit off more than I could chew, whatever. 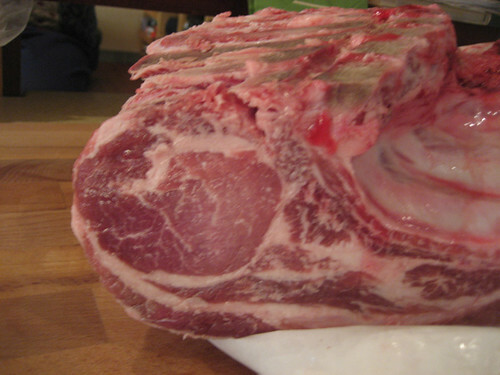 Here’s my saga of an intense day of porkology, and hell if I know if it will prove successful in the end. I would end up doing something with all of these except the last today. First off, I cut the bellies in half and added the cure and maple syrup to three of the belly halves (the fourth went to Cathy). That was old hat, and easy. I sliced it out and trimmed it up, and Cathy got the pleasure this time of massaging the seasoning and cure into it. That was easy too, and it went into the fridge for about two weeks of absorbing the cure. Meanwhile, I set to dicing and cubing the meat and backfat for the next and most ambitious parts of today’s adventures in advanced porkitude. My plan was to make two dry-cured sausages today. 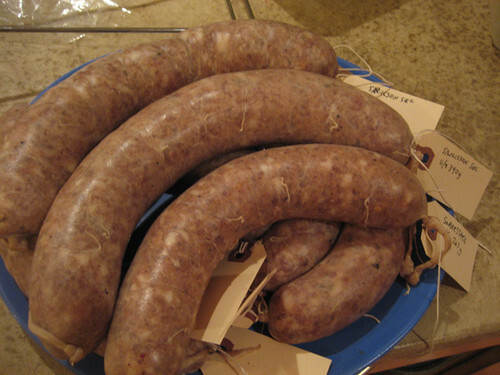 The first was from Ruhlman’s book— a saucisson sec, a simple French country garlic and pork shoulder sausage. The second, a bit more ambitious, was the sopressata from Paul Bertolli’s Cooking By Hand, a book widely used by professionals of my acquaintance (the Eckhouses taught themselves to make prosciutto out of it; Rob Levitt cited it as his main guide as he began making charcuterie at Mado). That the latter is geared more toward professionals is evidenced by the fact that I had to cut the recipe by 2/3rds to equal the quantity produced by Ruhlman’s recipe, about 6 lbs. 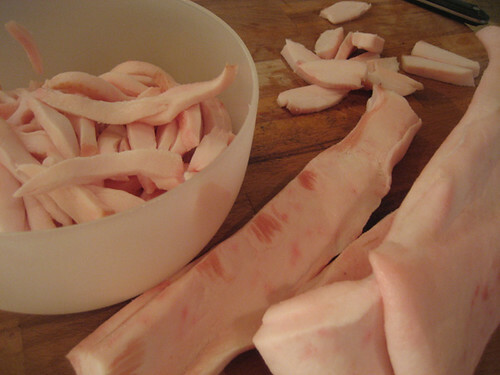 Now, one thing I quickly learned is that sausagemaking is not a hobby you take up casually at no great expense. I had the Kitchenaid with the grinder and sausage stuffer attachments, and some dextrose left over from the original coppadventure, but I still wound up having to buy 1) a smaller scale capable of measuring grams, 2) a better boning knife, 3) Instacure #2 and 4) Bactoferm starter culture (which promotes lactic acid formation, preventing nasty things like botulism) by mail from Sausagemaking.com, and a container of salted pork intestines at Paulina Market— and that was only after I’d decided not to make big sopressata in 4″ wide cow intestines, because they only come in a $35 tub of 500 feet worth or some such. You could spend a small fortune just getting ready for this, and as with the fortune of the late Mobuto Sese Seko promised you by a banker in Nigeria, it’s only the fact that you’ve already put so much money in that keeps you from stopping and saying the hell with it all at some point where doing so would be the only logical thing left to do, if you weren’t delusional by that point. Into the freezer it all went. First up to grind: pork shoulder and backfat for the saucisson sec. 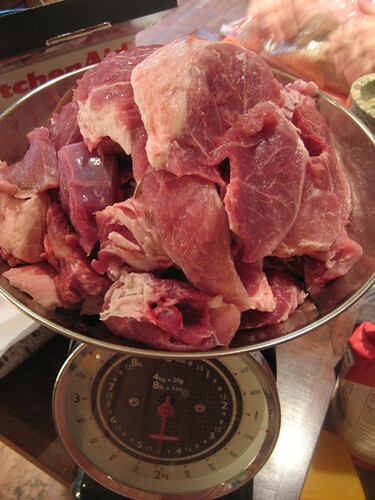 And here we encountered one of the problems with the Kitchenaid as a sausagemaking tool: you can grind about half a pound before the silverskin and whatnot in the pork shoulder has wrapped itself around the blade and rendered it useless. So I had to break the machine down and clean the blade and the thing with the holes it pushes the chopped meat through, every couple of minutes. It made what should have been a few minutes of grinding into most of an hour; I was instantly envious of Eddie Lakin of Edzo’s, who told me when I interviewed him for a video that his grinder has a way of catching that stuff and wrapping it around the auger before it can choke off the blade. 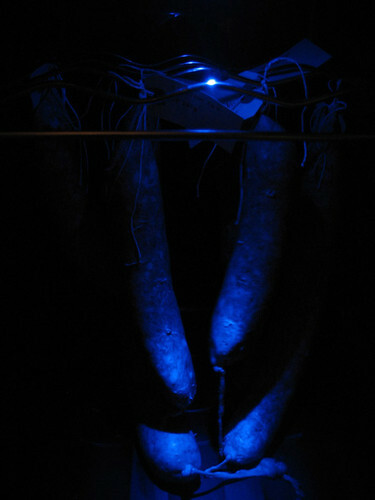 I tied them off and attached tags indicating which sausage they were and their weight in grams at the time of making. At this point I realized something: my little wine fridge wasn’t big enough to hold these sausages, an equal quantity of another kind, and a coppa. But the pork leg and backfat for the sopressata were already cut, so Cathy suggested that I make one or two sopressata as a test and freeze the rest of the meat for future use. So we ground it all and I packed up most of it, measuring out one pound of the meat and then dividing Bertolli’s recipe by 15 to get the proper amounts. Thankfully, at least the pork leg ground easily without the connective tissue problems the shoulder had had. On the other hand, the thing that’s really a crapshoot is whether we did the Bactoferm starter culture right; by now we were working with such small quantities relative to Bertolli’s recipe that we could only guess how accurate we were. At least two things I think should prevent any possible nastiness such as botulism: one, that it’s much smaller than the customary sopressata, so it should dry out more readily than a bigger sopressata and cure more quickly, and two, when we fried up a little of each sausage and tasted them, they were both already quite salty. So I would think that the salt should help prevent some of these problems, though I’m not sure if it will be too salty by the time it’s shrunk a bit and become more concentrated. Even if the sausages are a total loss— and I don’t think they will be, but they may not be all that great, either— at least the coppa should work and I have, left over, a somewhat whittled-down but still decent size shoulder and about a half a ham, each of which should make for a nice, non-cured main dish at some point. But I just don’t know about the sausages; stay tuned to see if it proved too much for me, or if I’m just selling the day’s effort short because it’s worn me down. Maybe, with luck, the day will come that the pain and difficulties are forgotten but the taste makes it all worthwhile. That’s a whole lotta sausage business for one day anyway you slice it. I like my KA grinder attachment, but you gotta make sure it’s on tight, I mean real tight, I learned that after a year or so of being annoyed with crap wrapping around the blade. Also the attachment lives in the freezer. I don’t know if that is KA spec but it works for me. And forget about using it to stuff, very frustrating. I found a good cheap 5lb stuffer, made sausage making life much nicer. Good luck on the dry sausages, I’m sure they’ll be fine. I set up a drying box and whatnot for curing but I just don’t have the patience for it. Thanks for the link, keep in touch. Looks good to me! I know days like that. When it comes to tasting though, it will have been worth it. Did you use pink salt? I didn’t see any mention of it, but I’m pretty sure Ruhlman calls for it. At any rate, if you did, the sodium nitrate/nitrite in that will prevent botulism and how! Instacure #2 is the pink salt with the nitrates that turn into nitrites or vice versa, I can never remember.